The Pride C1 Dual motor Petite Riser recliner chair has compact dimensions and a low seat-to-floor height to make it the perfect choice for the petite individual. 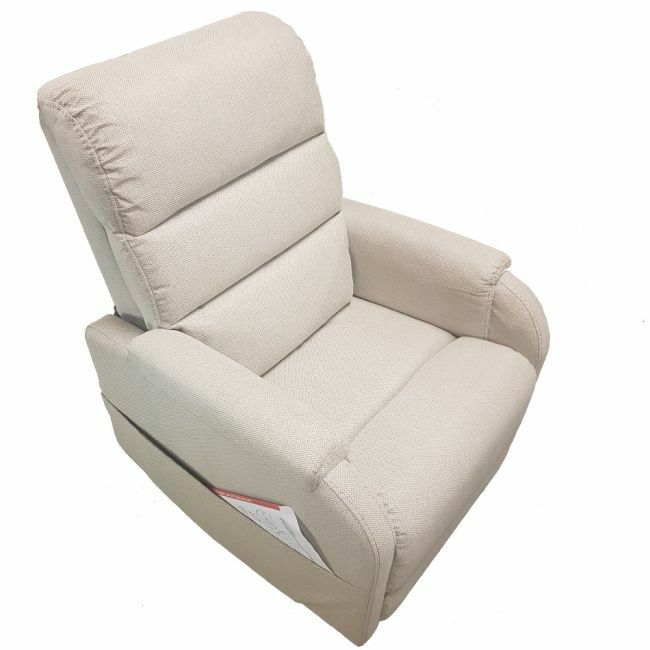 Available in a neutral coloured covering the Pride C1 Dual motor Petite Riser recliner chair will suit most decors. It has a 3 part waterfall backrest and an easy to use up / down controller. Easy to setup and simple to use, this comfortable chair is ideal for the shorter person as it has a low seat height. Upholstored in a neutral "fresh" fabric that will suit most decors. 3 part waterfall backrest and an easy to use up / down controller. Easy to setup and simple to use, this comfortable chair is ideal for the shorter person with a low seat height. The handset has an annotated button for ease of use and also a USB charging point for phones or tablets etc. In addition the footrest extends slightly automatically as the chair reclines to lengthen the support for the users feet. Back Width - 51cm / 22"
Seat to floor - 43m / 17.5"
Seat Depth - 43cm / 18"
Seat Width - 46cm / 20"
Top of back to seat - 66cm / 26"